New Maryland is a village in central New Brunswick, Canada; located south of Fredericton, south of Route 2 and Route 101. As of 2011, the population was 4,232. Its population meets the requirements for "town" status under the Municipalities Act of the Province of New Brunswick. 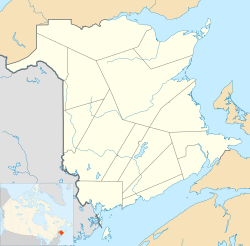 New Maryland is one of the wealthiest communities in New Brunswick as it has the highest median household income of any municipality in the province. The name "New Maryland" has been used to describe a farming community and parish for over 100 years, but in the 1970s and 1980s, several suburban subdivisions were constructed in the area. New Maryland was officially incorporated as a village in 1991. Today the village is home to several businesses including a pub, pizza shop, pharmacy, post office, and two gas stations. New Maryland is also home to an elementary school which serves the village and its outlying areas. Virtually all of the residents now commute to Fredericton. New Maryland is the site of the last fatal gun duel in New Brunswick which occurred between George Frederick Street and George Ludlow Wetmore. This proclamation appears on the sign for New Maryland on the adjacent TransCanada Highway, Route 2. This New Brunswick location article is a stub. You can help Wikipedia by expanding it.